White paper on crime 2004 Part1/Chapter1/Section1/1. The principal data on penal code offenses in2003are as follows. Non-traffic penal code offenses refer to penal code offenses excluding professional negligence in traffic accidents . 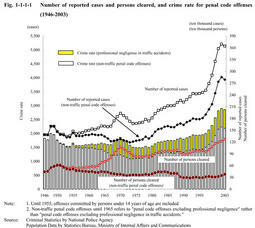 *"Crime rate"means the number of reported cases per100,000persons. Fig. 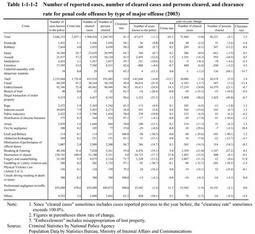 1-1-1-1 shows the number of reported cases and persons cleared,and crime rates for penal code offenses and non-traffic penal code offenses since1946(see Appendix1-1 ). The number of reported cases for penal code offenses had continued to increase sharply,registering a new postwar high every year for seven years from1996.In2003,however,it decreased by47,675(1.3%)from the previous year to3,646,253for the first time in nine years,but still remaining at a high level over the overall postwar period.By type of offence,the number for theft decreased by141,644(6.0%)from the previous year,which is a major cause of the overall decline.The crime rate for penal code offenses has shown almost the same trend,reaching2,857in2003. Table 1-1-1-2 and Fig. 1-1-1-3 show the number of reported cases for penal code offenses by type of offense,in which theft has the largest share,followed by professional negligence in traffic accidents,destruction of objects,embezzlement(including misappropriation of lost property),fraud,and breaking and entering. The number of persons cleared for penal code offenses has been generally on the rise since1992.In2003,it reached1,269,785,registering a new postwar high every year for five years. Table 1-1-1-2 and Fig. 1-1-1-3 show the number of persons cleared in2003,by type of offense.Professional negligence in traffic accidents has the largest share,followed by theft,embezzlement(including misappropriation of lost property),injury,fraud,and assault. Fig. 1-1-1-4 shows the clearance rates for penal code offenses,non-traffic penal code offenses,theft,and non-traffic penal code offenses excluding theft over the last30years. 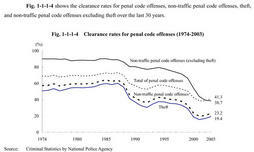 The clearance rate has been on the decline in recent years.In2001,it was38.8%for penal code offenses and19.8%for non-traffic penal code offenses,both of which were the lowest in the postwar period.However,it has increased somewhat since2002,to41.3%for penal code offenses and23.2%for non-traffic penal code offenses in2003.This recovery was because the clearance rate for theft,which accounted for more than60%of penal code reported cases,rose from15.7%in2001to17.0%in2002and to19.4%in2003.The clearance rate for non-traffic penal code offenses excluding theft still has declined in2003. Fig. 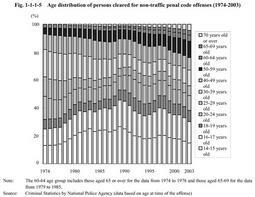 1-1-1-5 shows the age distribution of persons cleared for non-traffic penal code offenses over the last30years.It indicates a characteristic tendency that the share of those aged60or over has increased from2.5%in1974to12.2%in2003due to the aging of the total population.The share of those aged65or over was7.8%in2003.